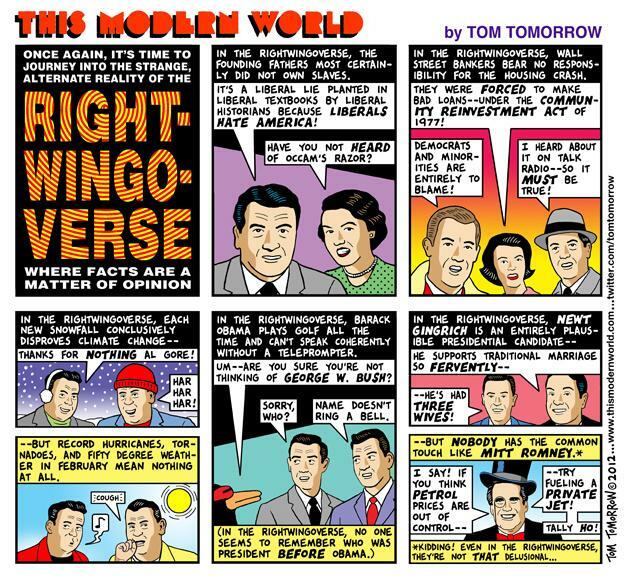 Tom Tomorrow (Dan Perkins) lives outside of New Haven, Connecticut with his wife and their nine year old son. 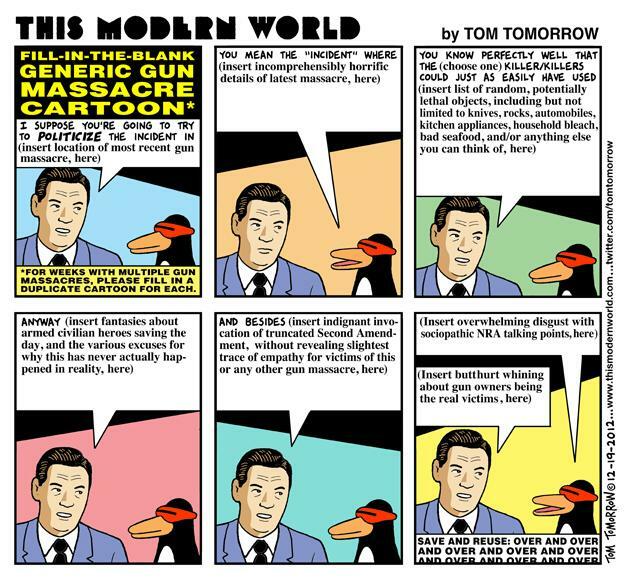 His weekly cartoon, This Modern World, appears on Daily Kos, where he is also editor of the comics section he created in April of 2011 in an attempt to provide a new, online venue for political cartooning. 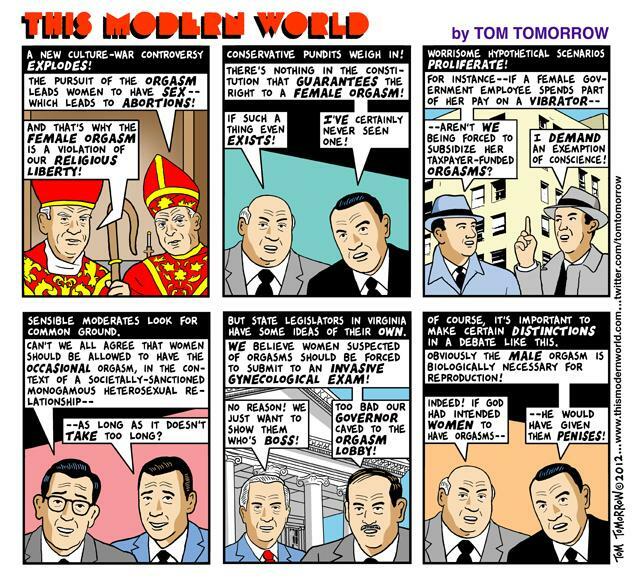 This Modern World also appears at TheNation.com and in approximately 80 papers across the country, including the Village Voice, the San Francisco Bay Guardian, and the Pittsburgh Post Gazette. His cartoons have also been featured in New York Times, The New Yorker, The Nation, U.S. News & World Report, Esquire, The Economist, and numerous other publications. He was awarded the first place Robert F. Kennedy Journalism Award for Cartooning in 1998 and again in 2003. He has also been awarded the first place Media Alliance Meritorious Achievement Award for Excellence in Journalism, the first place Society of Professional Journalists' James Madison Freedom of Information Award, the James Aronson Award for Social Justice Journalism, and the Association for Education in Journalism Professional Freedom and Responsiblity Award. He is the author of ten cartoon anthologies and one children's book, and in 2009 collaborated with the band Pearl Jam to create the artwork for their album, Backspacer. Judges for this year’s contest were Matt Bors, a nationally syndicated cartoonist in altweeklies and winner of the 2012 Herblock Prize; Jenny Robb, curator of the Billy Ireland Cartoon Library & Museum at Ohio State University; and Steve Brodner, satirical illustrator who has covered eight national political conventions for Esquire, The Progressive, The New Yorker and others. 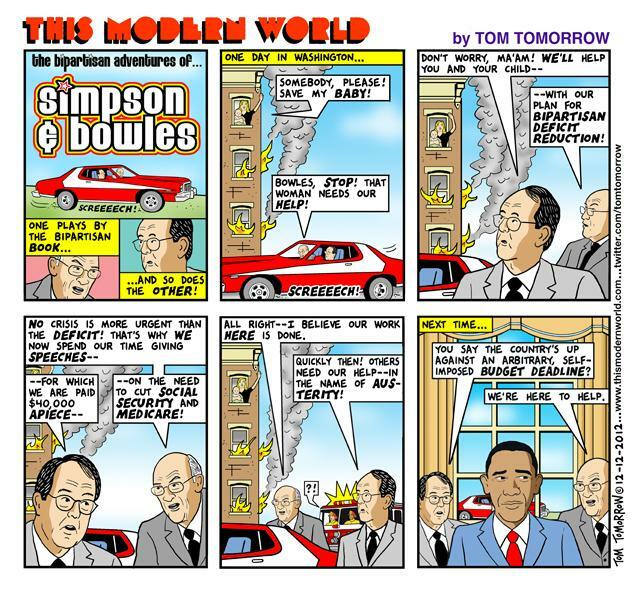 Is the American Editorial Cartoon Making a Comeback? First and foremost, I want to thank the Herblock foundation and this year's judges for this extraordinary honor. Thank you to Marci and Sarah and everyone else who had anything to do with this. It's really extraordinary and I have a hard time expressing how much this recognition means. I want to thank my wife and son for making everything possible.. My wife is awesome, always there to help talk out an idea, or just as often to provide one of her own. She should probably have a co-credit on this award, to be honest. My son is nine, and he's awesome too. He recently wrote a picture book about a hamburger and his pet french fry. They get in a war with an apple. I'm hoping I can put him to work writing cartoons before too much longer. And I need to thank all the editors and publishers who give me space and continue to support my work each week, because without them, I would not be standing here this evening. Now, winning a prize named after Herblock is a bit like winning a prize named after Einstein or Picasso. It's an honor, but it's more than a little humbling. You're probably not gonna live up to that. Herblock's career spanned seventy years. He took on the cold war, the arms race, civil rights, Watergate, gun control, and almost any other topic you could think to mention. 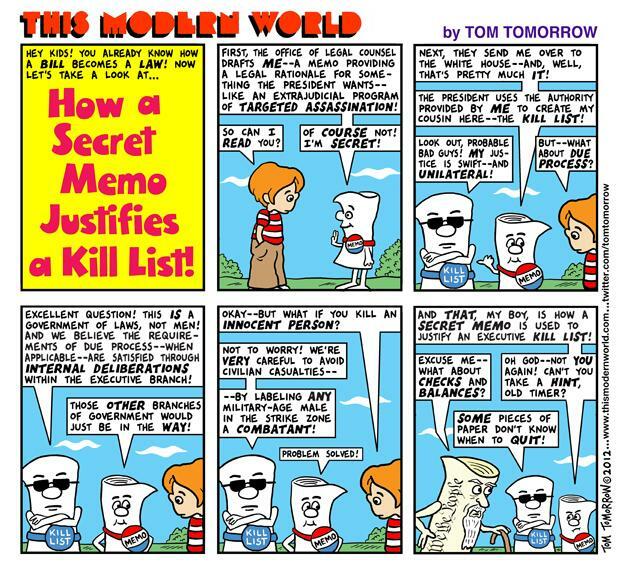 The term McCarthyism was coined in a Herblock cartoon. I have several of his books on my shelves, and I was browsing through them recently in preparation for this evening, and I came across a couple of quotes I'd like to share. In a book published in 1958, he wrote of the problems which will face future historians looking back at his era. "In studying our national and international affairs, they're likely to be struck by the paradox of how we could have been so frightened and so complacent, both at the same time." He's writing about the cold war, but that's a pretty accurate description of America in the twelfth year of the War on Terror. "They're likely to find it curious that as we developed wider and wider means of communication, we seemed to have less and less to communicate to each other. They'll find endless speeches about freedom, and perhaps they'll wonder just what we did with all that freedom, or how many of the people who talked about it even knew what it was,"
Again, all of which could have been written at any point in the last five or ten years. I had the privilege of meeting Herblock, at a cartooning conference, in 1998 or so. There's a tradition, at these ceremonies, to share your Herblock anecdote. I'm sorry, I wish I had one! We shook hands, exchanged a few pleasantries. He seemed like a very nice man. But I'm glad our paths crossed. He was close to ninety at that point, a legend in the field. 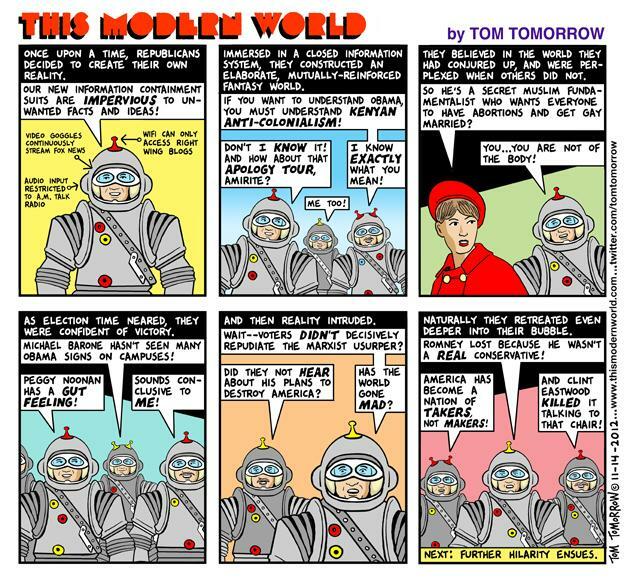 I was the altweekly guy, the weirdo cartoonist who used too many words. I'd like to think that our goals were pretty similar though. To call out injustice and abuses of power. 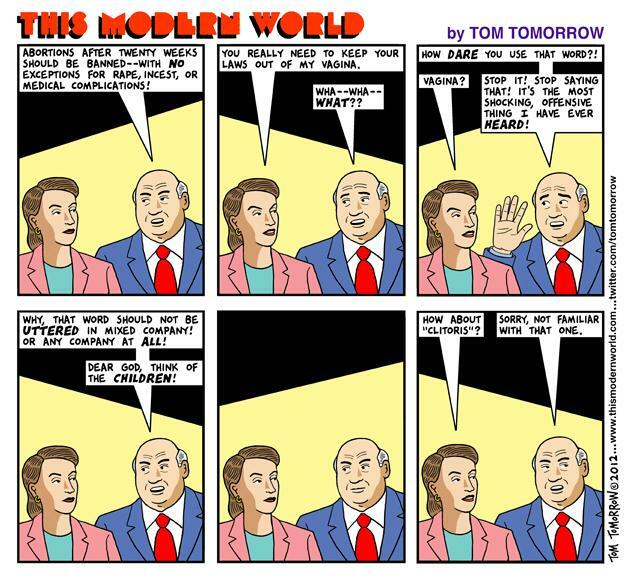 To "comfort the afflicted and afflict the comfortable," as the saying goes. But my work does come out of a somewhat different tradition. And of course I was profoundly influenced by the artists who trailblazed the alternative weekly path ahead of me. Jules Feiffer, who pretty much invented this genre.. Matt Groening whose strip Life in Hell made cartoons and altweeklies synonymous in the minds of readers. I definitely wouldn't be here if not for those guys. In the early eighties I was working a succession of what I think you'd technically call soul-crushing temp jobs, and the cartoons in the back of the local weekly paper were like a lifeline to a drowning man. They were pushing the boundaries and rewriting the rules, and I saw that stuff, and thought, I want to be part of that. And I was lucky enough to make that happen, to carve out a small space for myself. I've been earning a living as a cartoonist for more than two decades now, which by Herblock's standards means that I'm just getting started. I've done it solely through self-syndication -- I've never had a staff job, or institutional support, or really any guarantee of continued income whatsoever beyond next week's cartoon. You could say I've been living by my wits alone. although that makes it sound like I've been out in the woods foraging for nuts and berries. The life of a freelancer is not quite that bad, though this suit and tie business is something of a rarity for me. I mean, I'm a cartoonist. I work at home. I get up in the morning, have some coffee, wander into my studio. This is the first time I've worn pants in several weeks. I'm kidding about that, in case anyone is worried. I want to be clear: I often wear pants! But it's a strange job. 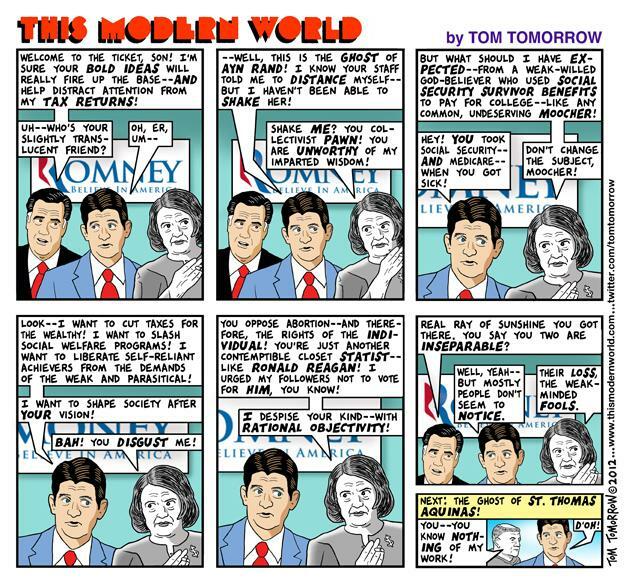 As political cartoonists, we annoy people for a living. Kind of like those guys who dress up like Elmo in Times Square. Though honestly, I think those guys might have better long-term career prospects. If I had a dime for every time someone has told me over the past twenty years that the cartoons are the first thing they turn to in a publication, then I would have a very large pile of dimes. Which could come in handy, the way things are going! 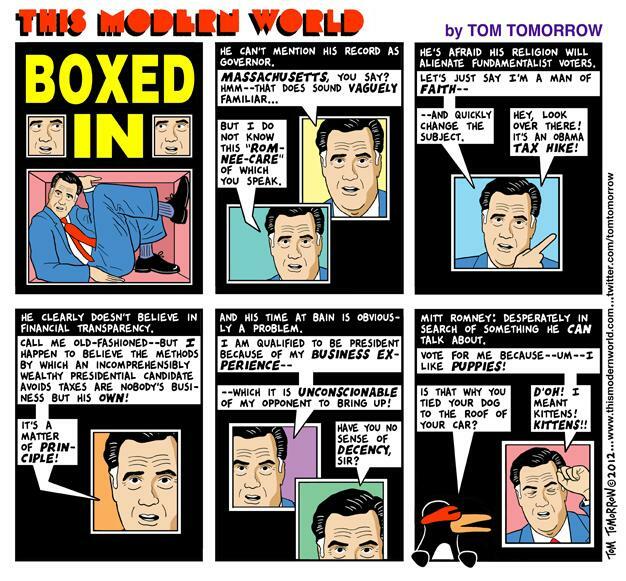 The transition from print to digital has not been an unmixed blessing for political cartoonists. In some ways it's been great. We're no longer confined by the geography of physical print. Our reach is global now. We've got more readers than ever. Unfortunately the coin of the realm online is still mostly exposure. Which is to say, the opportunity to work for free in order to possibly get another opportunity to work for free. There are some exceptions. 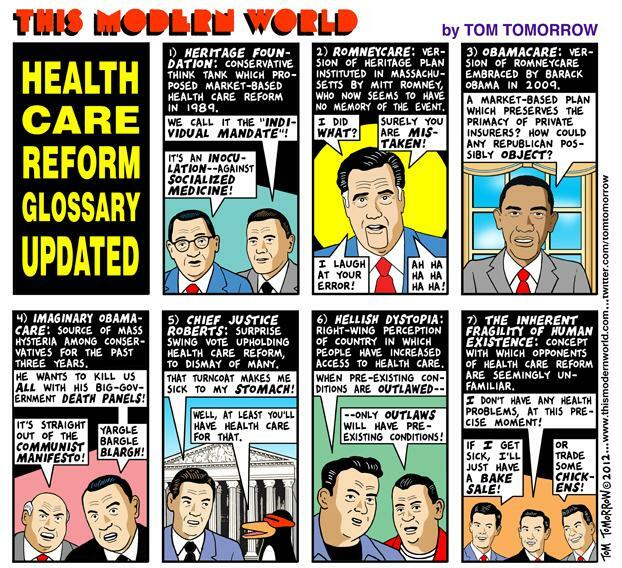 Markos Moulitsas at Daily Kos has been a steadfast supporter of political cartooning, and I thank him sincerely for that. 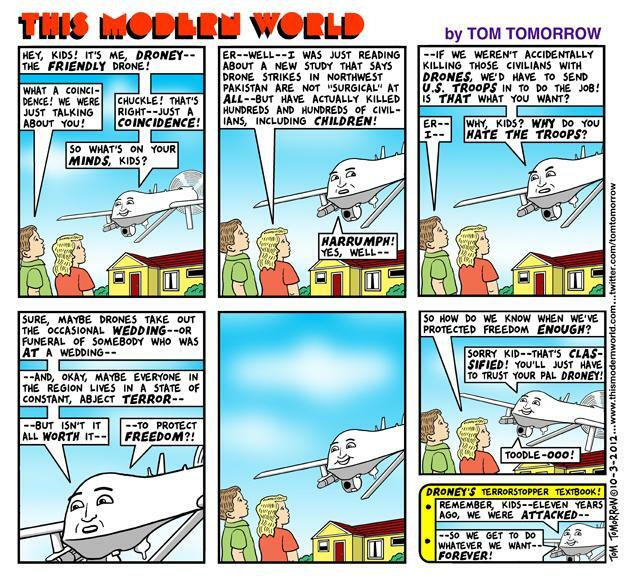 Sites like Truthout and The Nation are keeping cartoons in the mix as well. And my friend Matt Wuerker has an actual staff job at a website, over at Politico. Which makes him a rare and mythical creature. Like a unicorn, or the Loch Ness Monster. If you catch a glimpse of him tonight be sure to snap a picture. But a lot of sites that you'd expect to run political cartoons, don't. I guess it make sense. Generic stock photography is probably cheaper. And in poll after poll, if there's one thing readers say they enjoy most of all, it's generic stock photography. No, wait, I got that mixed up. It's actually cartoons. I think there's also a culture gap between word people, who run these sites, and image people -- though I'm clearly doing my best to bridge that particular divide. If you think about it, cartoonists actually have to do most of what writers do, in terms of researching an idea and constructing an argument and thinking it through. And then on top of that we have to find a way to convey the point we want to make, through some clever visual metaphor, or some combination of pictures and words. Some of us with more words than others. But you know what they say about Ginger Rogers -- she did everything Fred Astaire did, except backwards and in high heels. Well, that's true for political cartoonists, especially the so-called alternative cartoonists -- we do everything political columnists do, except backwards and in high heels. I explained already about how I work alone at home all day, right? …or put it into the mouths of tentacle-waving aliens of planet Glox, who for instance, deal with their own entitlement cutbacks by leaving the elderly and infirm on the northernmost plains to be consumed by the great and terrible beasts which roam there. On Glox, the debate is over precisely how MANY elderly and infirm should be abandoned in the name of austerity. 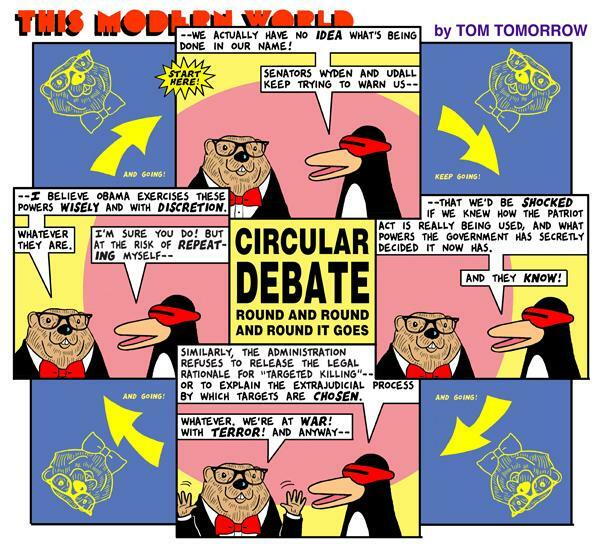 Which is pretty much the debate we're having here, filtered through the lens of satire. Human beings are tribal creatures. We divide the world into teams, and root for our own side. But that's not how satire works. Satire is about probing the spots that bother you, whether or not they're conveniently partisan. This is not to say that we don't take sides -- strongly held opinions are at the very core of what we do. But satire which values partisanship over truth, is not satire at all, but rather propaganda. And there's a reason that "propagandist" is not a job title anyone wears with pride. So sometimes a reader will write to say that a cartoon on a given topic is "depressingly accurate," or that they would laugh if they weren't too busy crying. I guess they mean these things as compliments, and gosh, what cartoonist doesn't strive to inspire tears of existential futility? But I hope they laugh anyway. Cause that's the whole point of this job. It's a two pronged assault. There are lot of things in this world you need to be outraged about, but outrage unchecked by laughter will eat you up inside. You need to laugh. That's where we come in. So I was rehearsing this speech in front of my nine year old son, who took a few notes, which I thought I would useful as a closing summary. To quote verbatim: "Thanks people. In book guy writes about problems. Weirdo with too many words. Grew up on Mad, lucky to be a cartoonist. Works at home, often wears pants." I won't even suggest that I have a chance of living up Herblock's legacy, but I do promise to remain inspired by the example he set, and to keep doing the best work I can do. thank you and enjoy the rest of the evening. Drinks are on me.